Libby Pantazis is as colorful as her cheerful gallery that brightens up the corner of 2nd Avenue and 22nd Street. She greets clients with ginger ale and popcorn, and her enthusiasm for Birmingham’s creative community is contagious. 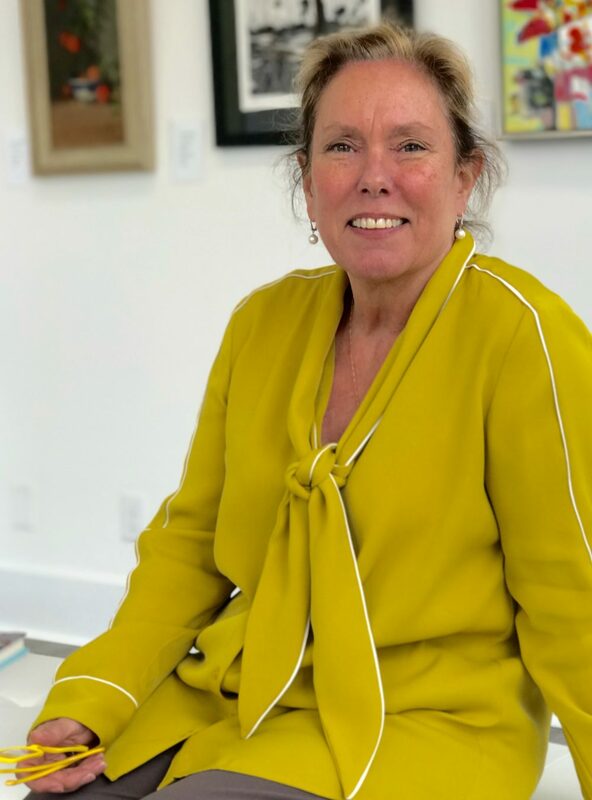 She is curious, quick-witted, and extraordinarily articulate about her passions – traits that served her well in her former career as an civil rights attorney and now as the owner of Canary Gallery. Originally from Fairbanks, Alaska, Libby has called Birmingham home for over three decades. We sat down to talk about creative DNA, what excites her about Birmingham, and why you might catch her listening to Tupac. As a gallerist and a painter, what is your perception of Birmingham’s art scene? I don’t view art unilaterally. To me, art encompasses all innovative fields – painting, sculpture, music, performance, sewing, writing, food, tech, and so much more. Our citizens are hungry for culture. Birmingham is unique; we have a post Civil War city with a lot of diversity, an artistic community that thrives on collaboration, and city leadership that views our potential through a creative lens. I believe Birmingham’s art scene is vibrant and will continue to thrive. I have watched Second Avenue evolve as a micro example of what our creative community has built, and those brilliant minds are the type of people I get to experience. What do you hope to bring to that atmosphere? I hope to provide a place for all types of creatives to visit, gather, share and feed off of each other’s passions. The Birmingham Museum of Art has done an excellent job of encouraging a younger generation to learn, enjoy, and understand what art means. I want to do that too. I’m serious about art but definitely not snooty about it. The gallery has a tv installed, alongside works of art, that is consistently streaming news coverage of important current events and sometimes even a football game. I employ a young staff that keep the energy in the gallery fresh and the playlist eclectic. My playlist ranges from Bach to Tupac. Yes! I think music is such an important element to an event. I work closely with my artists and private event clients to curate a soundtrack that accompanies their specific vision and message. I believe creativity is in our DNA, and that we all have the capability for it. You began your career as an attorney – what some might view as a more analytical occupation than your current role as a painter and gallery owner. How did it feel to make that transition? I don’t think there was a transition. I definitely have that creative DNA; I think we all do – just in different mediums. I have always been a writer, and I applied those skills when I was writing legal briefs. I think that the attorneys who thrive are creative thinkers; they have to figure out how to put the pieces of a puzzle together in a case. When I stepped away from my legal profession, I did so with the full support of my family. The gallery is very much a family business, and I feel encouraged to continue to stretch myself artistically and be a model for other creatives. When it comes to your own work, what inspires you as a painter? Light. On a trip to France, I was captivated by the way the light looks different there; the sun doesn’t set until nine o’clock at night, and it hits the architecture in a way that casts interesting shadows. I tend to paint without a lot of editing. I deliberate for a long time on light, shadows, and composition before I even begin a piece. When the concept is completely finished in my mind and keeps me up at night, I know I have to paint it right then. Madison Faile, from Montgomery, is a young artist who I am excited to spotlight this month. His father was a successful photographer and his mother a dancer, so art has always been a part of his past. He lost his parents, and his work is teeming with deep and haunting symbolism. Bruce Holwerda, a Birmingham favorite, will be featured in our October show as well. That show opens Thursday, October 18. I also love Patty B. Driscoll, William Rushton, Nelson Grice, Debra Riffe, Richie Gudzan, and Amy and Sam Collins. How do you like to spend your time away from the gallery? Drinking Sancerre and eating popcorn! It’s my default dinner when my husband is away and I’m not cooking for anyone. I’m happiest when I am able to spend time with him and my three sons who all live in Birmingham as well. We are tight-knit, and I revel in their lives and our time together.